RUCOOL hosted two meetings held by NJBPU for NJ’s Offshore Wind Strategic Plan. These meetings were stakeholder roundtable discussions with environmental & fisheries stakeholders held at IFNH, and included RUCOOL tours. RUCOOL was one of two representatives of RU at a WIND Institute planning meeting hosted by NJEDA and the Office of Secretary of Higher Education. RUCOOL hosted a meeting with regional commercial fishers, RUCOOL faculty and staff, and other RU faculty to discuss research needs given the planned offshore wind development in our region. Mid-Atlantic Ocean Forum, Monmouth University: RUCOOL networked with several people regarding ongoing offshore wind and fisheries interests, and Grace led a breakout session focused on ocean acidification. RU30 pH glider with oxygen (pHoxy Lady) was deployed for one month of pH, oxygen, temperature and salinity measurements across the NJ shelf. This is the start of several pH glider deployments for 2019 to observe seasonal carbonate chemistry dynamics. RUCOOL hosted a visit by the MTS leadership that immersed their administrative staff into hands on oceanographic research and enabled our undergraduate students to meet and discuss their research with MTS leadership. MTS awarded RUCOOL 15 free memberships for Rutgers undergraduate students. RUCOOL initiated discussions at NOAA EMC, the Naval Research Laboratory, and the Naval Oceanographic Office on the use of gliders in hurricane intensity forecasting. This included presentations on glider data impact studies from the 2018 hurricane season and planning sessions for the 2019 Hurricane glider deployments. RUCOOL was a technical lead and presented at the IEEE Current Measurement, Turbulence and Applications meeting in San Diego, CA. RUCOOL attended an invite-only US DOE Workshop on Research Needs for Offshore Wind Resource Characterization in Washington, DC, March 5-6. RUCOOL was featured on the Bigten LiveBIG YouTube Channel Video. RUCOOL completed an 8-week ecosystem survey along the West Antarctic Peninsula. RUCOOL continues to prepare for the EGO/UG2 International Glider Meeting in May. Members of COL and IOOS visited RUCOOL March 14th for a strategic planning session. Working with Texas AM to raise funds from a donor for support of building CUBA ocean observing. The Chancellor of Texas AM committed dollar for dollar match for the first 300K of the donor contribution to purchase CODARS for CUBA. Erick Fredj from the Jerusalem College of Technology completed his two month sabbatical hosted at RUCOOL. Erick worked on several collaborative projects including sea breeze, Antarctic ecosystem and HF radar research. Cristina L Archer, Sicheng Wu, Ahmad Vasel-Be-Hagh, Joseph F Brodie, Ruben Delgado, Alexandra St. Pé, Steven Oncley, Steven Semmer. The VERTEX field campaign: observations of near-ground effects of wind turbine wakes, Journal of Turbulence, https://doi.org/10.1080/14685248.2019.1572161. A Nature Research Journal. https://doi.org/10.1038/s41561-018-0268-4. Evan B. Clark, Andrew Branch, Steve Chien, Faiz Mirza, John D. Farrara, Yi Chao, David Fratantoni, David Aragon, Oscar Schofield, Mar M. Flexas, and Andrew Thompson. Station-Keeping Underwater Gliders Using a Predictive Ocean Circulation Model and Applications to SWOT Calibration and Validation. IEEE Journal of Oceanic Engineering. 1109/JOE.2018.2886092. Colette J. Feehan, William C. Sharp, Travis N. Miles, Michael S. Brown**, Diane K. Adams. Larval influx of Diadema antillarum to the Florida Keys linked to passage of a Tortugas Eddy. Coral Reefspp 1–7. DOI: 1007/s00338-019-01786-9. Sian F. Henley, Oscar M. Schofield, Katharine R. Hendry, Irene R. Schloss, Deborah K. Steinberg, Carlos Moffat, Lloyd S. Peck, Daniel P. Costa, Dorothee C.E. Bakker, Claire Hughes, Patrick D. Rozema, Hugh W. Ducklow, Doris Abele, Jacqueline Stefels, Maria A. Van Leeuwe, Corina P.D. Brussaard, Anita G.J. Buma, Josh Kohut, Ricardo Sahade, Ari S. Friedlaender, Sharon E. Stammerjohn, Hugh J. Venables, Michael P. Meredith. Variability and change in the west Antarctic Peninsula marine system: Research priorities and opportunities, Progress in Oceanography Vol.173. https://doi.org/10.1016/j.pocean.2019.03.003. **McKee, D., Martinson, D. G., Schofield, O. 2019. Origin and attenuation of mesoscale structure in circumpolar deep water intrusions to an Antarctic shelf. Journal of Physical Oceanography. doi:10.1175/JPO-D-18-0133.1. Oliver, M., Kohut, J., Bernard, K., Fraser, W., Winsor, P., Statscewich, H., Fredj, E., Cimino, M., Patterson-Fraser, D., Carvalho, F. 2019. Central place foragers select ocean surface convergent features despite differing foraging strategies. Scientific Reports, 9, 157. 9:157 DOI:10.1038/s41598-018-35901-7. **Yajuan Lin, Scott Gifford, Hugh Ducklow, Oscar Schofield, Nicolas Cassar. Towards Quantitative Microbiome Community Profiling Using Internal Standards, American Society for Microbiology | Applied and Environmental Microbiology. DOI: 10.1128/AEM.02634-18. Rick Spinrad, President, Marine Technology Society, Zdenka Willis, President-elect, Marine Technology Society, Donna Kocak, Immediate Past President, Marine Technology Society, Liesl Hotaling, Vice President of Education, Marine Technology Society, Ruth Perry, Marine Scientist and Regulatory Policy, Shell Exploration and Production Americas team, Doug Copeland, Regional Development Manager at EDF Renewables, Krisa Arzayus, Deputy Director, US IOOS, Brick Wenzel, Ocean County Farm Bureau , Jeremy Grunin, Grunin Foundation, Peter Seligmann, Chair of Conservation International, Hurricane meetings at National Research Lab, Invited seminar at University of Maine, Invited Public Talk as part of the Ambassador John Price & Marcia Price World Affairs Lecture Utah, American Society of Limnology and Oceanography, Puerto Rico. RUCOOL is coordinating the Rutgers interaction with various state agencies as they develop the framework for a WIND Institute focused on research and workforce development in the emerging offshore wind sector. RUCOOL attended an RU Meet and Greet with state officials framing the WIND institute. RUCOOL (met with local NJ Farm Bureau (Brick Wenzel) to discuss research needs that explore links between offshore met-ocean conditions and coastal farms and the potential impacts of offshore wind farms. RUCOOL Article: A New Way to Predict Sea Breezes May Benefit Offshore Wind Farms. Carried by numerous outlets including but not limited to: futurity.org, newswise.com, reddit.com, offshorewind.biz, Enginnering360, and NJ 101.5 interview (Joe Cutter). A point paper on glider data assimilation in Navy and NOAA ocean models requested by Admiral Okon’s Technical Director, Bill Burnett, after the November NOAA/Navy leadership brief was submitted to Navy and NOAA, forming the basis for visits to CNMOC and NRL in February. Began work with IOOS leadership to establish a sustained funding process for the Hurricane Sentinel Glider Picket Lines successfully demonstrated during the 2018 Hurricane Season. RUCOOL co-hosted the polar-izing your science NSF workshop with University of Delaware. The workshop introduced polar scientists from around the world to several science communication tools to broaden the impact of their research. Brodie et al., Utilizing Climatological Analysis to Improve Forecasting of Offshore Wind Ramps, AMS Annual Meeting, 10th Conference on Weather, Climate, and the New Energy Economy. RUCOOL at Palmer Station Antarctica deploys glider outfitted with multi-frequency acoustic system to measure krill abundance. RUCOOL visited Texas A&M University to begin planning the tri-national glider effort to observe the Loop Current for the National Academy of Sciences decadal Loop Current program. RUCOOL attended the National Academies of Science Loop Current kick off meeting and presented a unified approach to HF Radar data quality and management, now considered to be the National Gold Standard for HF Radar. RUCOOL traveled to Ensenada, Mexico for the second tri-national planning meeting for the Loop Current glider observation program. RUCOOL delivered a short course on underwater glider technology to Chilean students at the University of Valparaiso. Erick Fredj from the Jerusalem College of Technology began his two month sabbatical hosted at RUCOOL. Erick will work on several collaborative projects including sea breeze, Antarctic ecosystem and HF radar research. Cross, J.N., Turner, J., Cooley, S.R., Newton, J., Azetsu-Scott, K., Braby, C.E., Canesi, K., Chambers, C., Dugan, D., Goldsmith, K., Gurney-Smith, H., Harper, A., Jewett, L., Joy, D., King, T., Kurz, M., Morrison, R., Motyka, J., Ombres, E., Paguirigan, M., Regula-Whitefield, C.M., Saba, G.K., Silva, E., Smits, E., Vreeland-Dawson, J., Wickes, L. Submitted to Frontiers in Marine Science. The Knowledge-to-Action Pipeline: Connecting Ocean Acidification Research and Actionable Decision Support. Community white paper for OceanObs’19, September 2019, Honolulu, HI. **Oliver, M., Kohut, J., Bernard, K., Fraser, W., Winsor, P., **Statscewich, H., Fredj, E., Cimino, M., Patterson-Fraser, D., **Carvalho, F. 2019. Central place foragers select ocean surface convergent features despite differing foraging strategies. Scientific Reports. Vol 9, Article #157. Testor, P., DeYoung, B., Rudnick, D., Glenn, S., Hayes, D., Lee, C., Pattiaratchi, C., Turpin, V., Heslop, E., Saba, G., Kohut, J., Schofield, O., Miles, T., and 88 others. Submitted to Frontiers in Marine Science. Ocean gliders: A component of the integrated Global Ocean Observing System (GOOS). Community white paper for OceanObs’19, September 2019, Honolulu, HI. Clark, E., Chien, S., Farrara, J. Fratantoni, D., Schofield, O., Thompson A., Branch, A., Mirza, F., Chao, Y., Aragon, D., Flexas, M. Precise station keeping for underwater gliders using a predictive ocean current model. Journal of Ocean Engineering. In press. Lin, Y., Gifford, S. Ducklow, H., Schofield, O., Cassar, N. Towards quantitative marine microbiome community profiling using internal standards ISME. In press. McKee, D., Martinson, D. G., Schofield, O. Origin and attenuation of mesoscale structure in circumpolar deep water intrusions to an Antarctic shelf. Journal of Physical Oceanography. In press. Miles, T., Slade, W., **Gong, D., and Kohut, J. Suspended particle characteristics from a Glider integrated LISST sensor. MTS/IEEE Oceans. Charleston, SC. In Press. Prakash, Dicopoulos, Roarty, Morel, Canals, **Evans (2018) “Development of Sargassum Seaweed Tracking Tools” MTS Oceans. In press. Archer, C.L., Brodie, J.F., Rauscher, S.A. Global warming will aggravate ozone pollution in the U.S. Mid-Atlantic, Journal of Applied Meteorology and Climatology. Friedland, K. D., Morse, R. E., Manning, J.P., Melrose, C.D., Miles, T.N., Goode, A., Brady, D. C., Kohut, J., Thomas, A.C., Powell, E.N. Disjunctive Regime Shifts in Surface and Bottom Thermal Environments of a Continental Shelf Ecosystem, J. Geophys. Res. Oceans. Goldsmith, K.A., Lau, S., Poach, M.E., Sakowicz, G.P., Trice, T.M., Ono, R.C., Nye, J., Shadwick, E.H., Saba, G.K. In review. Scientific Considerations for Acidification Monitoring in the U.S. Mid-Atlantic Region. Estuarine, Coastal and Shelf Science. Kobelt, J., Sharp, W., Miles, T., Feehan, C., Localized impacts of Hurricane Irma on Diadema antillarum and coral reef community structure, Estuaries and Coasts. Parra, S., Greer, A., Book, J., Deary, A., Soto, I., Culpepper, C., Hernandez, F., Miles, T., Acoustic detection of zooplankton diel vertical migration behaviors on the northern Gulf of Mexico shelf, Limnology and Oceanography. Saba, G.K., Goldsmith, K.A., Cooley, S.R., Grosse, D., Meseck, S.L., Miller, W., Phelan, B., Poach, M., Rheault, R., St. Laurent, K., Testa, J., Weis, J.S., Zimmerman, R. Recommended Priorities for Research on Ecological Impacts of Coastal and Ocean Acidification in the U.S. Mid-Atlantic. Estuarine, Coastal and Shelf Science. Saba, G.K., **’Wright-Fairbanks, E., Chen, B., Cai, W.-J., Barnard, A.H., Jones, C.P., Branham, C.W., Wang, K., Miles, T. The development and validation of a profiling glider Deep ISFET pH sensor for high resolution coastal ocean acidification monitoring. Frontiers in Marine Science. **Slesinger, E., Andres, A., Young, R., Seibel, B., Saba, V., Phelan, B., Rosendale, J., Wieczorek, D., Saba, G The effect of ocean warming on black sea bass (Centropristis striata) aerobic scope and hypoxia tolerance. PLoS ONE. Submitted. 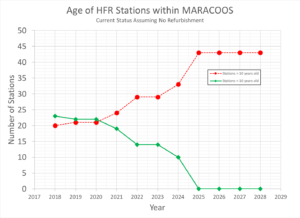 The MARACOOS HF Radar Network was formed in 2007 with the funding of the proposal “Phased Deployment and Operation of the Mid Atlantic Regional Coastal Ocean Observing System (MARCOOS)”. The network has grown from 24 stations in 2007 up to 38 stations in 2018. The network has been delivering hourly surface currents to the US Coast Guard since May 2009 with no interruption. However the age of the network is weighing on the operations as some of the stations in the network are approaching 20 years of service. The figure below chronicles the age of the radars in the network as of 2018. Time line indicating the age of the HF Radar stations in the Mid Atlantic. 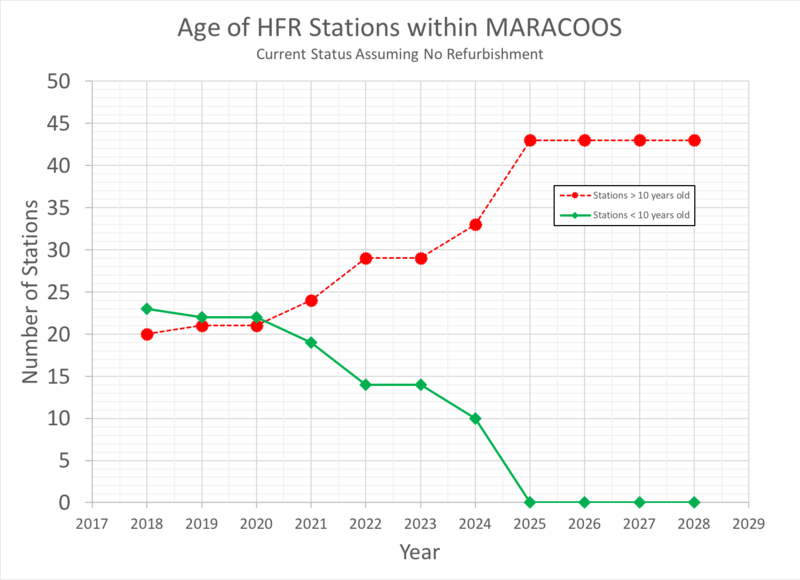 The green line indicates stations that are less than 10 years old while red shows number of stations with a service life greater than 10 years. The REI Offshore Wind Working Group, in collaboration with Rutgers State Relations, is accelerating partnership development with the Governor’s office, NJBPU, NJDEP, and offshore wind developers, and commercial fishing. Highlights include discussions with developers on performing right whale detections with gliders, meetings with NYSERDA to develop plans for federal DOE investments, meetings with commercial fishing groups to promote state interests in both fishing and offshore wind energy. RUCOOL has been recognized as international leader in environmental science and engagement for offshore wind. RUCOOL has lobbied to establish the nation’s first State Oceanographer starting when Joe Seneca was VP for Academic Affairs. We have never been closer to achieving this historic goal for New Jersey. RU COOL arrives at Palmer Station Antarctica and begins sampling for the 27th field season for the LTER program. At the MarCuba conference in Havana, developed the process to establish an MOU between InsMet (Cuban Weather Service), Rutgers and Texas A&M to bring the first HF Radars to Cuba, significantly expanding the international HF Radar Network in the Gulf of Mexico for the National Academy of Science Loop Current Program. Challenger glider recovered offshore Sri Lanka and returned to Rutgers after a hypothesized giant squid attack, shifting efforts to Magellan Glider Mission to 500 years later race Magellan around the world. Established the new MTS Unmanned Untethered Vehicle (UUV) committee, including leading the kick off Town Hall that included NOAA, Navy and Industry leadership. Greer, A., Schofield, O., Miles, T., et al. (2018), Functioning of Coastal River-Dominated Ecosystems and Implications for Oil Spill Response: From Observations to Mechanisms and Models, Oceanography, 31(3), doi:10.5670/oceanog.2018.302. Kohut, J., Glenn, S., McDonnell, J., Miles, T., Saba, G., Schofield, O. Workforce Development Supporting the Blue Economy: A Master’s Program of Integrated Ocean Observing at Rutgers University. OCEANS’18 MTS/IEEE, Charleston, SC, USA, 2018, pp. 1-8. **Oliver, M., Kohut, J., Bernard, K., Fraser, W., Winsor, P., **Statscewich, H., Fredj, E., Cimino, M., Patterson-Fraser, D., **Carvalho, F. 2018. Central place foragers select ocean surface convergent features despite differing foraging strategies. Scientific Reports. In Press. Saba, G.K., Goldsmith, K.A., Cooley, S.R., Grosse, D., Meseck, S.L., Miller, W., Phelan, B., Poach, M., Rheault, R., St. Laurent, K., Testa, J., Weis, J.S., Zimmerman, R. In review. Recommended Priorities for Research on Ecological Impacts of Coastal and Ocean Acidification in the U.S. Mid-Atlantic. Estuarine, Coastal and Shelf Science. Chave, R., Buermans, J., Lemon, D., Taylor, J.C., Lembke, C., DeCollibus, C., Saba, G.K., Reiss, C.S. 2018. Adapting Multi-Frequency Echo-sounders for Operation on Autonomous Vehicles. OCEANS’18 MTS/IEEE, Charleston, SC, USA, 2018, pp. 1-6. Saba, G.K., **Wright-Fairbanks, E., Chen, B., Cai, W.-J., Barnard, A.H., Jones, C.P., Branham, C.W., Wang, K., Miles, T. 2018. Developing a profiling glider pH sensor for high resolution coastal ocean acidification monitoring. OCEANS’18 MTS/IEEE, Charleston, SC, USA, 2018, pp. 1-8. **Yi, X., Glenn, S., **Carvalho, F., Jones, C., Kohut, J., McDonnell, J., Miles, T., **Seroka, G., Schofield O. 2018. Glider technology enabling a diversity of mesoscale ocean sampling capabilities. In Challenges and Innovations in Ocean In-Situ Sensors, Delory and Pearlman (Eds). Elsevier, York. Pp. 367-374. Schofield, O., Aragon, D., Jones, C., Kohut, J., Miles, T. N., Roarty, H., Saba, G., **Yi, X., Glenn, S. 2018. Maturing glider technology providing a modular platform capable of mapping ecosystems in the ocean. In Challenges and Innovations in Ocean In-Situ Sensors, Delory and Pearlman (Eds). Elsevier, York. 173-193. LTER Tri-Annual Network Wide Meeting, Radar Operators Working Group, Bermuda Biological Station Glider training, American Wind Energy Association Offshore Windpower, US Army Corps of Engineers, Marine Technology Society Meetings, MARACOOS Board Meeting, State of the Science Workshop – Biodiversity Research, NJ Spotlight Offshore Wind Energy, NOAA Headquarters-Hurricanes, US NAVY CNMOC – Hurricanes, Multiple Orsted meetings, OCEANS 2018 Charleston (5 RUCOOL speakers), Rutgers Ideation meeting, KIOST – Rutgers Joint Program Agreement Meeting.